Prints and patterns are so in right now, it can be tough to keep track of what’s hot and what’s not. But one thing’s for sure – palm trees are cropping up on everything from dresses and short to tanks and tees to make our favorite spring and summer fare extra tropic-festive. I don’t know if it’s Coachella withdrawals, the summer season looming ahead, or the desperate need to take a vacation soon (even if it’s just vicariously! 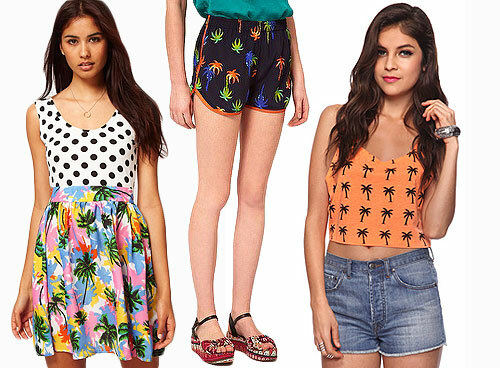 ), but palm tree prints are getting hotter by the day. They’re a fun way to add a funkier vibe in place of your typical spring florals, and depending on the colors, the look is young and fun but still updated, on-trend, and sophisticated in its boldness. Try on a pair of silky shorts for size – which are great with a pair of platform sandals or wedges – or dare to mix prints like this Paprika dress does, for a fun contrasty look. And of course, if you’re ready to bare your midriff as the weather heats up, Forever 21 is serving up some cute palm-print crop tops!